Bella: I just want to thank you Traci in advance for taking the time out of your hectic schedule to interview with me. Traci: No problem at all. I would like to thank you for considering me for an interview. 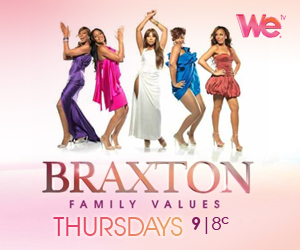 I watch “The Braxton Family Values” weekly and have been following the show since the very first season. How has being a reality star changed your everyday life? The biggest change is all the travel we have to do. Sometimes it seems as soon as I return home, I have to turn around and travel again. Don’t get me wrong, I’m not complaining at all. The next change would be when I go out to the stores around the DMV. Sometimes I get funny looks like, “Is that Traci Braxton.” Other than that, not much change. You look absolutely gorgeous in the new promo pics and last season we witnessed Toni expressing her concern over your weight, did that motivate you to start a new health routine? If so, what does your workout routine consist of? Thank you so much. At first Toni expressing her concern bothered me in a negative way. I was basically mad, but once I thought about it, she was only concerned about her sister’s health. So, to answer your question, yes, it motivated me. I just began to really watch what I ate and I do a lot of cardio work on the treadmill and bike and sometimes I go jogging. I don’t eat a lot of fast food like I use to and I stay away from those unhealthy snacks. Did you ever encounter pressure from music execs or the industry surrounding your previous size? If so, what advice do you have for ‘curvy’ women to inspire them to keep pushing towards their dreams? To be honest with you, no, I never had to encounter the pressure from music execs because before I lost the weight, I wasn’t at that point in my career to try and start a music career. I didn’t encounter any direct pressure from industry surroundings, but with the type of things that have been targeted for me, I did need to trim down. As for advice for curvy women, I would only say to keep pushing forward no matter your size. We are all beautiful women no matter our size. You just need to be confident in yourself and if you show this, you will be successful in whatever it is you would like to pursue. How would you describe your sense of style? What happens to be your favorite trend of the moment and designer? To be honest, I don’t really have a favorite style. I actually like to change up and try different looks and styles. Currently, I truly do not have a favorite trend or designer. I know that you are married with a family so how do you balance filming the show in Atlanta & LA, doing promo tours and being a wife & mother all rolled in one? It’s tough, but you always find ways to get it done. I pretty much try to keep things at home in order in case I have to leave right away. When I know ahead of time of my travel, I get everything done before I leave. As I mentioned, its tough, but it can be done. We see you change your hairstyle quite often, do you prefer wigs or weaves and what is your favorite look for yourself? Do you style your sisters hair at all? I can go wig or weave. I think I like wigs better cause I just take it off or put it back on. Nice and easy. Its hard to say what my favorite look is. If I had to pick, I would probably say right now it’s the short hairstyle. I use to style my sister’s hair all the time, but because of the demanding schedule and now that I’m part of the show, I don’t get the time to style their hair like I use to. Last season you talked about opening up your own salon, how is the venture coming along? Is it opened and where can fans find your salon and what services do you offer? It’s still going, but not the only focus as it once was. It’s a lot into getting the salon going. So, its not close to being opened yet, but its still in the plans. Are you in the studio working on the Braxton album and if so, could we also expect a solo album from you as well? Can you tell us a little about your humanitarian endeavors? I don’t have anything currently going on, but I’m just focusing on doing a lot of community service with my sorority Zeta Phi Beta Sorority Incorporated as well as the Eastern Stars. Eventually, I would probably like to kick off some kind of awareness program dealing with rheumatoid arthritis. Many fans don’t know that you’re also a choreographer and a trained ballet dancer, who else have you worked with besides your sister Toni Braxton? I haven’t done anything recently with anyone as far as choreography goes. I did ballet dancing in high school and a little after I graduated. As you mentioned, the most recent choreography was with my sister. We both represent the DMV (DC, Maryland & Virginia) area, would you ever consider moving and if not, why? It’s hard to say if I would or not. You never know where a career may lead you. The DMV is my home and has been the majority of my life. I love this area and if I could have it any way, the DMV will always be home for me and any business I would be Blessed to have. Well I thank you for your time once again and I wish you the best on the new season and your future endeavors! Thank you and thank you for the opportunity to interview with you. I really enjoyed it. I Applaud Traci for being Generous with her time! You asked Traci Great questions and gave her many Opportunities to inform her Many Fans. However maybe/probably it’s just me, but the answers sounded like allot of idk from her. Just my own take. If my remarks appear negative, I apologize!